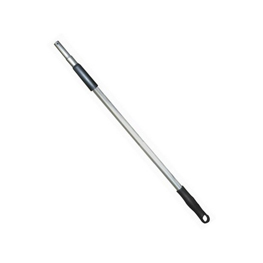 This Heavy Duty Telescopic Handle for Flat Mop has a firm twist-lock works with all Aluminum Flat Mop Holders. Pole is 7/8" x an adjustible length of 43" to 72". If your flat mop requires an acme thread see the acme thread cone adapter /cone-adapter-for-telescopic-pole/is available on this website.